Each year, through mid to late summer we grow aubergine plants at River Cottage HQ – they do really well in the poly tunnels. Aubergines are great when they are firm and fresh. I like them thickly sliced and chargrilled, served with lamb or grilled fish. Here I’m teaming up garlicky roasted aubergines with salad leaves and a tahini and yoghurt dressing. Pre-heat the oven to 180C/Fan 160C/350F. Slice the aubergines into rounds about 1cm thick. Place in a bowl and trickle over the olive oil. Season well and add the bashed garlic. Toss the whole lot together, then lay the aubergine out on a baking tray in a single layer. Cook for 30–35 mins, turning the slices once, halfway through. Meanwhile, place a small frying pan over a medium heat. Add the seeds, oil, sugar and salt and toss together as they toast. Cook for 2–3 mins until fragrant and beginning to pop a little. Set aside to cool. Put the tahini in a small bowl with the garlic, lemon juice and zest, yoghurt, honey and oil. Whisk with a fork until thick and creamy. If too thick, add water. Cut the base from each lettuce and discard any damaged outer leaves. Separate the lettuce leaves, wash and spin dry. 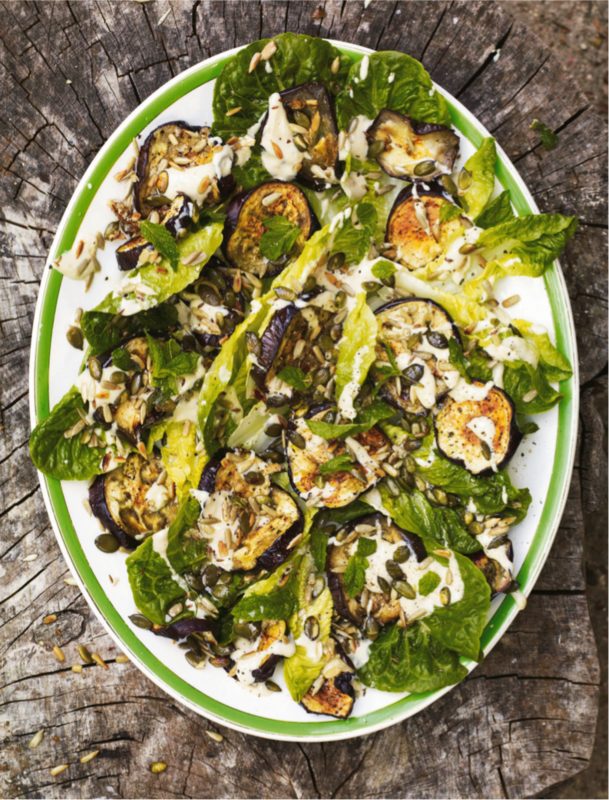 Arrange leaves over a large platter; top with aubergine slices, then spoon over the dressing.